Happy Friday & WELCOME to the “Winged Things” Paper Wing Production's Design Team Blog Hop & Giveaway! If you've arrived here from The Aviary­ ( http://paper-wings-productions.blogspot.com/) Blog, then you're in the right place. 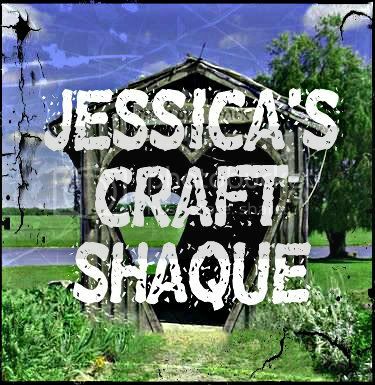 If you just happened to stumble into the hop, please CLICK HERE to start from the beginning. 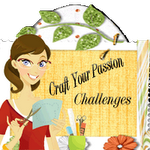 I am so honored to be asked by PWP to join them in this hop as a guest designer this month! Their stamps are beautiful and come out perfect every time! If you don't own any of the PWP's stamps, you should head over to their website and check them out! This month we’re featuring some of PWP’s gorgeous winged stamp sets and we’re giving away a gift certificate to one lucky follower. 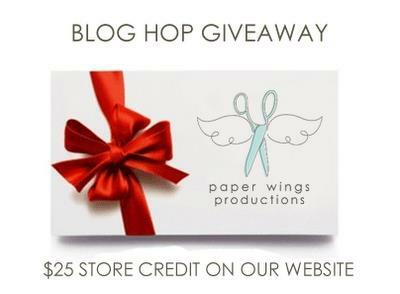 For a chance to win, all you need to do is: be a follower of the Paper Wings Productions blog, The Aviary. 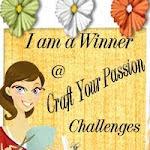 Visit each of the participating designer's blogs and leave them some love. Then go back to The Aviary and leave a comment letting them know you completed the hop. To increase your chances of winning, like the Paper Wings Productions Facebook page and/or invite your friends to the hop. Then just come back and let us know! Be sure to leave a separate comment for each of the additional entries. 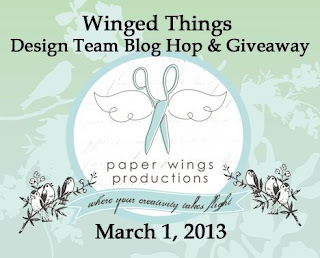 The winner will be announced on Tuesday, March 5th, 2013 on the Paper Wings Productions blog. For my project I used the Bird Panel Clear Stamp Set and you can find it HERE. I love this stamp set! It's so pretty and I love the little saying. For my simple but pretty card, I started with a piece of kraft cardstock and added a layer of red cardstock on with pop dots. I then stamped the PWP's bird and flower stamp on white cardstock and then colored in the image with Copic markers and added it on to the card. 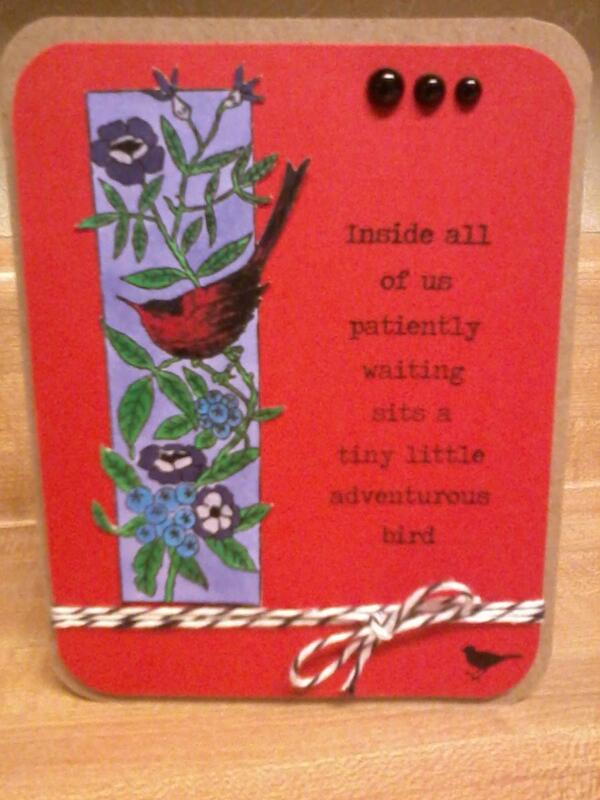 Next, I stamped the saying and small bird stamp right on to the red cardstock. I then added some black twine and some black pearls for the finishing touches. That's it..easy peasy! Hope you like it! 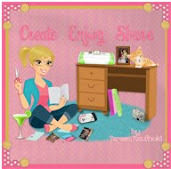 Make sure to head on over Dana Tatar's Blog - http://datatar.blogspot.com/ next! Hi Heather, thanks for joining us this month! Love this card! I can't wait to see that little bird! Beautiful job HL!!! LOVE your card!! Heather, so glad you are joining us this month and your card is beautiful! I love these panels and sentiments too. Great job! Such a beautiful sentiment on your lovely card! TFS Heather... be happy and have a fab weekend! This is beautiful Heather, I like the bird the verse and the twine. Love your card! 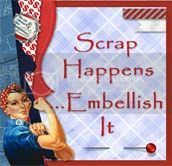 I have this stamp set and love the saying. Sometimes I just use the last 2 words "adventurous bird". Your kids are so cute! Heather, it is a pleasure to have you join us this month! I love your card...lovely colors and coloring...that little bird in the corner is a perfect touch. Off to become your newest follower. Beautiful card, Heather Lynn. 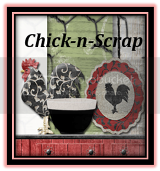 I love the bright colors you used for the coloring and background, and really enjoyed meeting your children on the sidebar! Cute family. Heather, what a beautiful card! I love that sentiment and the bird stamp is just so very cute! Super cute, love the colors! Thanks for joining us! Love the card and sentiment! Beautiful card! Love the panel stamps PWP has!! Love the card!!! I really like what it says and the bright colors. the astounding performance of this juicer. There are several steakhouses in NYC that are equipped to organize private parties for customers. Juicing is like sweet natural nectar from the Gods. Love the card design...great color!